A Saturday cafe breakfast is a wonderful way to welcome the weekend. With no weekday work commitments and with time on your side to sit back, relax, sip a cappuccino or two and enjoy a breakfast that is out of your normal weekday repertoire. 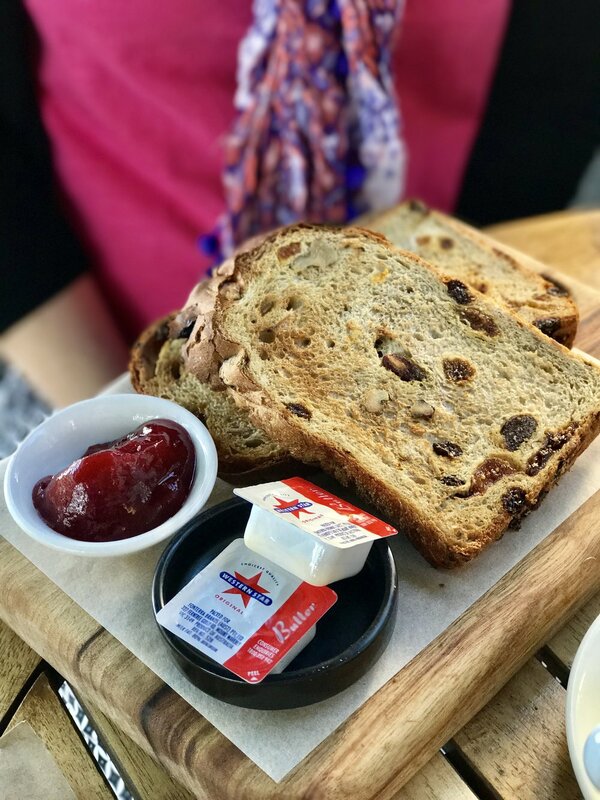 I was recently invited to enjoy breakfast at The Moray Cafe in New Farm. I have run past this cafe for many years but never dropped in for a coffee or a meal. Well now I wish I had stopped!! 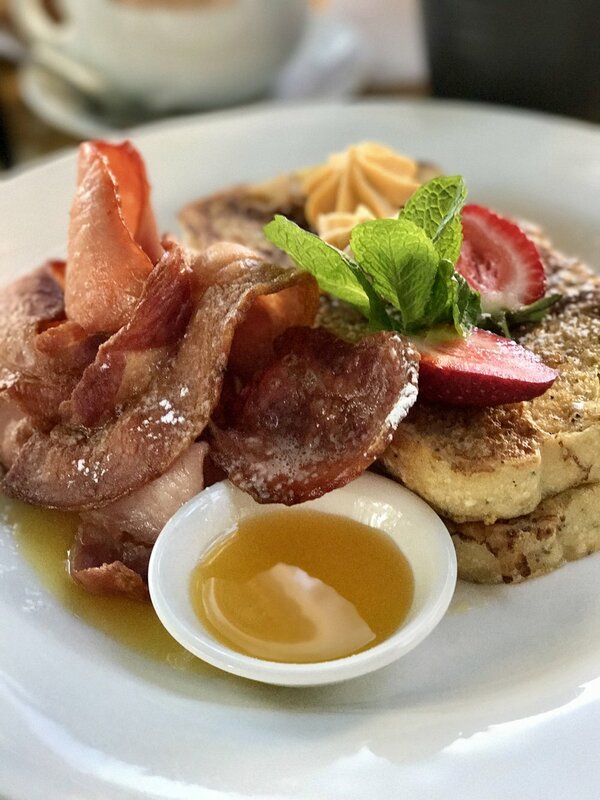 This little gem of a cafe serves breakfast and lunch 7 days a week and is located on the roundabout of Merythr Road and Moray Street New Farm, a street which was once named 'Brisbane's Most Liveable'. With inside bench seating and courtyard dining, The Moray Cafe has a warm and friendly ambience, stylish decor complete with fabulous green leafy wallpaper and a cake cabinet that captures your attention as soon as you step foot inside the cafe. Labelling itself as serving 'creative and modern' food we enjoyed Pumpkin French Toast - served with crispy bacon, whipped pumpkin and maple butter and finished with zesty orange suzette sauce. My 9 week pregnant companion ordered Fruit Toast and we both enjoy our obligatory Saturday morning cappachinos. My Pumpkin French Toast was impressive in presentation and an absolutely delicious combination of flavours. The french toast was moist without being too 'wet' and the orange suzette sauce was the perfect zesty finish to dress the dish. Service was friendly and prompt on what appeared to be a busy Saturday morning with a mix of regulars, a birthday breakfast and those new to the cafe. I can't wait to return to The Moray Cafe and try one of their other breakfast dishes perhaps the Breakfast Panna Cotta or The Moray or the Sicilian Scrambled Eggs sounds good too, maybe the Quinoa Brunch Bowl or perhaps the Costello Mushrooms ... hmmmm decisions, decisions - this is the type of dilemma I like to face on Saturday morning, deciding what to eat for breakfast. Be sure to stop by The Moray Cafe and experience breakfast for yourself. Let me know what you order.